Many of you know riding is all about the camaraderie of the group. For many it’s the main draw of having a motorcycle. Fortunately we’ve got a great group of riders with years of experience and haven’t had the kind of chaos that can be associated with large group-riding. That’s important because navigating around Milwaukee is like being a pro-snowboarder on Black Diamond bumps that go up, and those concrete cracks that go down and then being shot out of a half-pipe to change directions in mid-air. I’ve never, ever seen Interstate, streets or roads so bad. They are horrible! I ask folks about the roads and they would claim “allocations for street repair have gone up every year.” My question is where did all those funds go? Harley-Davidson doesn’t need a test track. They can just drive across town and based on the conditions of the road check to see what fell off, was worn out or destroyed! 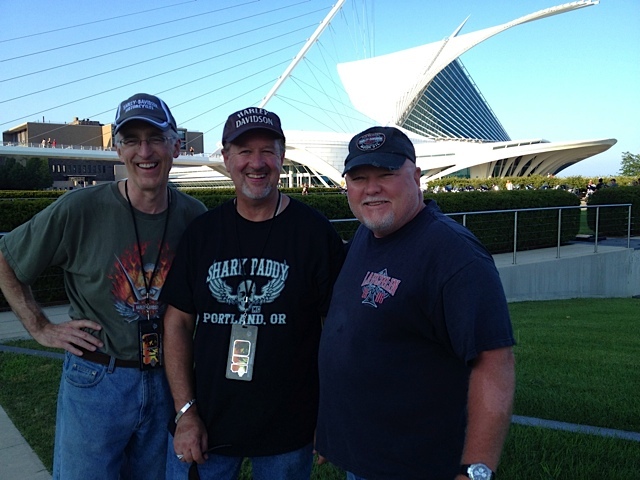 The only thing that could have drowned out the V-twin roar in Milwaukee was the music. 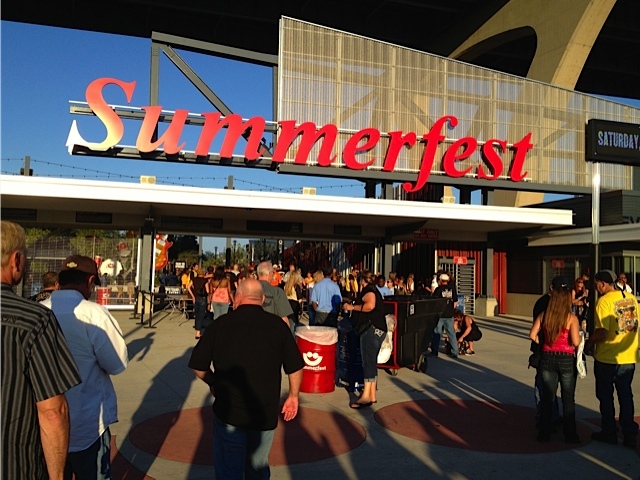 Wow, five years ago, 45 bands played the Summerfest grounds across two days. This year for the 110th, Harley-Davidson added an additional day plus 21 more bands. The motor company also expanded the number of headliners. Instead of building a separate venue in Veterans Park, as it did in 2008 for Bruce Springsteen and the E Street Band and Foo Fighters, Harley opted for more headliner options, with Toby Keith on Thursday, Aerosmith on Friday and Kid Rock on Saturday. 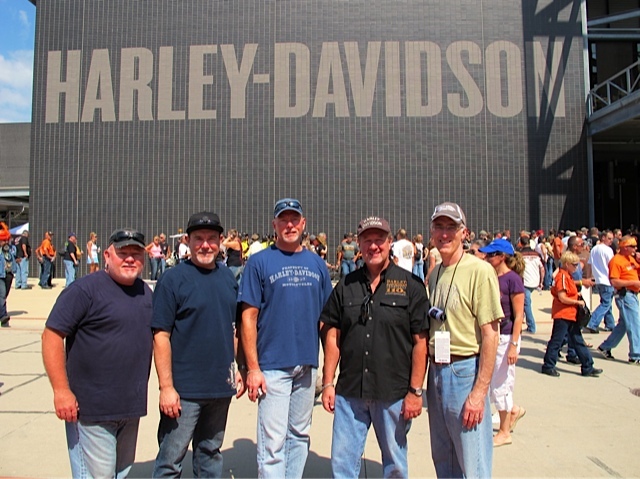 Then H-D leveraged the Marcus Amphitheater for even more musical acts to play on five stages. And they say classic rock is dead?! Sure, not only are the children of the baby boomers pushing thirty, but there’s a whole new generation of kids who have never experienced free-form radio or sitting in front of the stereo listening to full length albums, and if you’re even in the slightest into music then Milwaukee was nirvana. I captured a video of ‘Wille’ G., Bill Davidson and Karen Davidson, thanking all 110th Anniversary attendees for coming and they provided an introduction to the exceptional Kid Rock concert which also featured John Fogerty, but there was so much more. There was the Doobie Brothers, ZZ Top, Dierks Bentley and Brantley Gilbert. There was Chance the Rapper and Springsteen-inspired punk group The Gaslight Anthem. The “Sons of Anarchy” star Katey Sagal, performed with her band The Forest Rangers. And many local area acts ranging from Celtic punk group Whiskey of the Damned to Gabriel Sanchez and the Prince Experience. There was even a Mexican pop rock band Moderatto, which played at the Miller Lite stage. There were acts including Shooter Jennings and North Mississippi Allstars who were booked for performances at the Harley-Davidson Museum and the bands such as Sick Puppies and Puddle of Mudd who played at the free street parties. I’ve listed just a few and if that wasn’t enough competing with itself, the local Harley-Davidson dealers had bands playing all 3-days, including Aaron Lewis of Staind at the House of Harley-Davidson and Grand Funk Railroad at Hal’s Harley-Davidson. Our group went on the factory tours and talked with H-D reps about Project Rushmore, the 2014 model year touring bikes that received significant refinements to shortcomings that us owners have lamented for years. H-D has encapsulating over 2,400 new part numbers, and customers were sourced for input on updates that included liquid-cooling, touchscreen GPS, infotainment, improved venting, aerodynamics and ergonomics. The new touring motorcycles have a lot to offer and props to H-D for rolling out enhancements beyond the typical new paint schemes! We also pre-purchased tickets to experience the museum which featured the first known Harley model in existence from 1903. 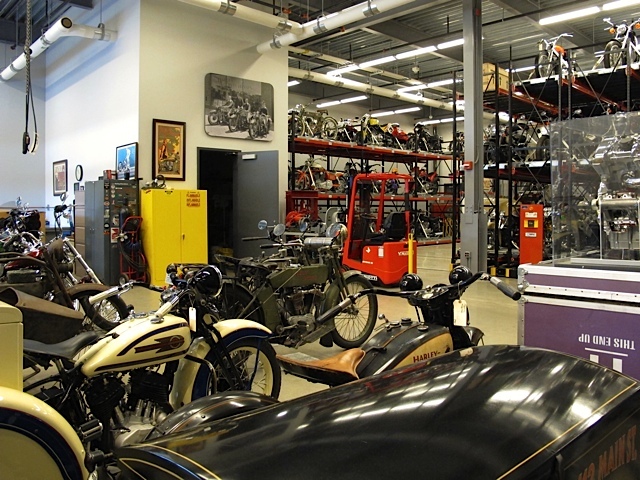 The museum has a truly fascinating collection of bikes, displays and some curious homage to Harley’s influence on pop culture and racing. 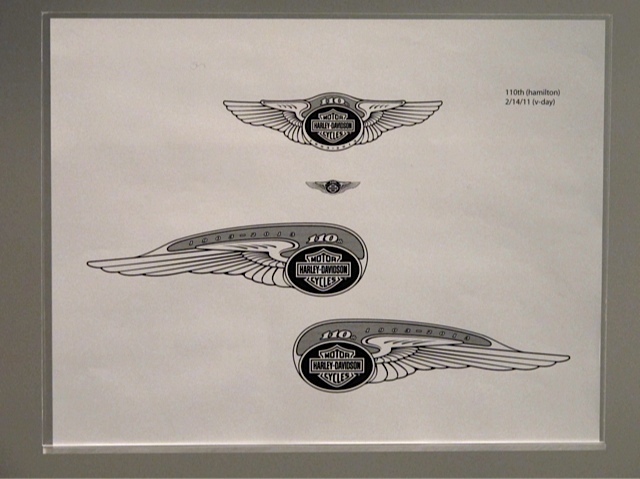 The history tour doesn’t gloss over the AMC troubled times as they were as much a part of the motor company’s legacy as were the high points. 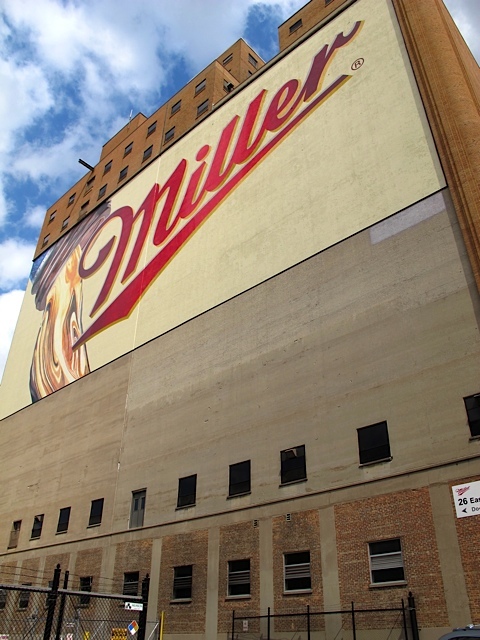 Prior to departing the city we stopped at the Miller Brewery and enjoyed the tour, refreshments and talking to one of the workers who was working the weekend doing a network upgrade. We got the inside scoop on the number of cases each employee has for a monthly allocation as well as where the employee pub is located for afterwork libations. Sounded like a fun job! If you were unable to make the ride home to Milwaukee it’s difficult to realize the full scope of the celebration from a couple of blog posts or photos. Our group was fortunate to have participated in the event and being there provides a unique perspective on how welcome and appreciative the residents of Milwaukee made us feel. Sure I ranted a bit about the roads, but the highways were absolutely jam packed with Harley’s of all shapes and sizes pointed towards “home” in honor of a company for the most part that has excelled for 110 years. Not many can say that about their history! Regardless of where we live or where we ride, there were a few days in 2013 that bonded us all together with the heritage of a HOG. 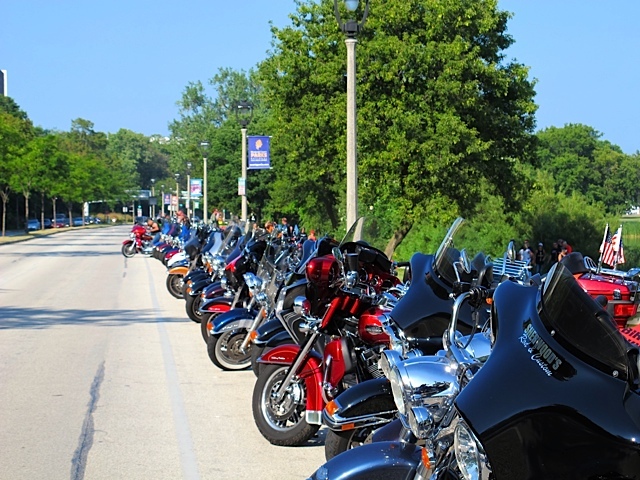 Since 1988, Harley-Davidson started throwing these hometown birthday celebrations every 5-years. The 110th has to be one for the record books in terms of attendees, fewest accidents, number of musical acts and from my vantage the number of smiles on attendee faces. 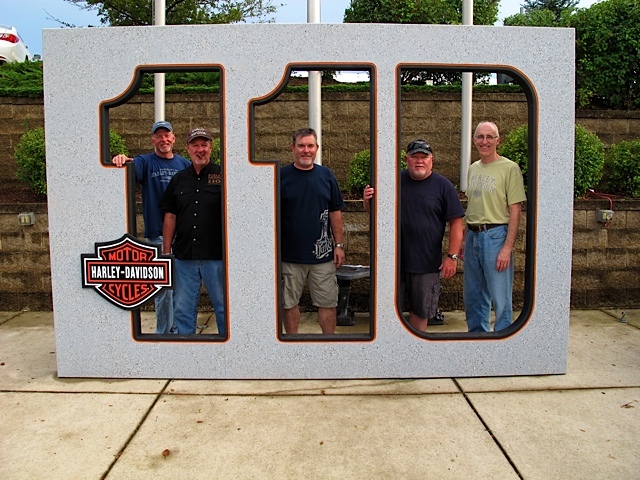 Thank you H-D for a great 110th celebration! Thank you Harley-Davidson for a great celebration and here’s to another 100+ years! The 110th Anniversary Homecoming – Part 1 (HERE) and Part 2 (HERE). 110th Anniversary Accident Stats: The final numbers are not published yet, but I found these initial statistics encouraging. 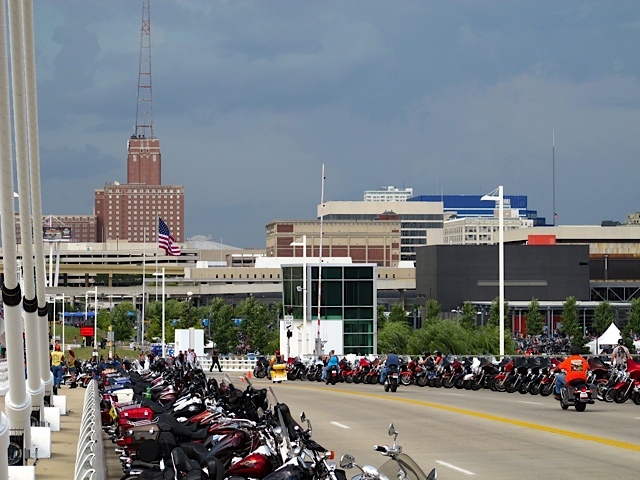 Approximately 100,000 riders arrived in the Milwaukee metro area over a 6-day (Aug 29 – Sept 1) celebration timeframe. There was an average of 4.9 motorcycle accidents per day. There were 28 motorcyclists transported to the trauma center during that timeframe. There were no reported deaths. Wisconsin is a helmet-optional state. It’s a reference to the Credence Clearwater Revival (CCR) song that gained popularity in the early ‘70s. It was written by John Fogerty and originally recorded for their Cosmo’s Factory album. It has a mellow acoustic, folk-rock feel to it that you can sing-a-long, but if you do I doubt you’ll feel good about riding in the rain! And speaking of rain. The “Rain Train” won’t stop. We’ve been plagued with a prominent winter weather pattern the past two months. It’s walloped the spring motorcycle riding season in the northwest. I’m not talking about weather that is somewhat imperfect for motorcycle riding…we’re talking about unseasonably cold temperatures, rain gushers, multi-day storms, wind shears, and what looks to be the new normal…riding in perpetual wet. They’ve switch from measuring the amount of rain fallen in a day to the number of consecutive days rain has fallen! Sad but true. Even if you get past all the Gore-Tex dress-up for the wetness, you still have traction and vision issues to confront. Nothing like hydroplaning on a motorcycle. Or how about those curves where the surface oil makes it feel like buttered Teflon? Most riders get use to riding in the rain more by accident than choice. You depart in the morning for a day long ride with the sun shining then you find a thunder shower sometime later in the day. I know some of you are saying “what rain?” Good for you. When it’s 49 degrees and sloppy, I say “Wet Ride? 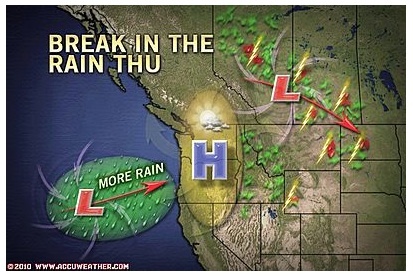 Why.” But, now I’m concerned that the wet weather will continue through the summer. I’ve resorted to surfing the net for better rain gear because not riding is not an option…for long.